SOIL erosion worldwide is threatening our agricultural base. Our farmers are suffering. The maximum amount of soil that an area can lose without affecting its ability to sustain plant growth is the soil loss tolerance value or the T value. Previously the T value for India was set at a uniform 11.2 tonnes of soil per hectare per year. Debashis Mandal and K P Tripathi, from the Central Soil and Water Conservation Research and Training Institute in Dehradun, recently conducted studies to assign specific T values to various parts of the country. Beginning their study in the Lakshadweep archipelago, Mandal and Tripathi used a model which took into account previously published data on its soil condition and erosion levels. The most important factor was the percolation of water which depends on the soil type. More the water infiltrates, lesser the soil erodes. The other factors were the soil's ability to resist physical degradation, organic carbon content, pH and density of the soil. Using all criteria, Mandal and Tripathi discovered that Lakshadweep can tolerate losing up to 7 tonnes of soil per hectare per year, without affecting its crop productivity. Only the coastal shoreline of Lakshadweep is subjected to severe erosion as the soil there is shallow and sandy and doesn't allow water to percolate. For the rest of the country the T values ranged from as low as 2.5 tonnes per hectare per year in Uttarakhand, Chhattisgarh, Andhra Pradesh and Maharashtra, where soil is 30-40 cm deep, to 12.5 tonnes per hectare per year in the Indo-Gangetic plains with a depth of 1.5 m.
Mandal said the next step is to identify areas where difference between erosion and tolerance levels is greater than 20 tonnes of soil. These are high risk zones requiring urgent erosion stalling measures. 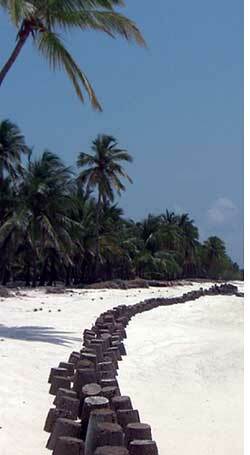 At Lakshadweep, tetrapods are used as wave barriers. They are four-legged structures, strategically placed to break the intensity of the incoming waves. Tripathi suggested growing mangroves as a natural barrier. The tetrapods can be used to protect the growing mangrove seedlings, he said.